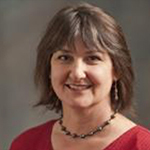 Kellie Rolstad is visiting associate professor of education at the University of Maryland. Her research interests include language education, language diversity, and multilingualism, in addition to more recent work on democratic and alternative education. Rolstad previously served as Associate Professor of Education in the Mary Lou Fulton Institute and Graduate School of Education at Arizona State University. She has served as a visiting scholar in the Graduate School of Education at both Harvard University and UCLA, and has worked as a Spanish-English bilingual kindergarten teacher in the Los Angeles Unified School District. Professor Rolstad holds a Bachelor’s degree in Linguistics, a Master’s degree in Applied Linguistics, and a PhD in Education from UCLA. She has published numerous articles and book chapters; examples of her work appear in Educational Policy, Teachers College Record, Bilingual Research Journal, Bilingual Review, and Hispanic Journal of Behavioral Sciences.